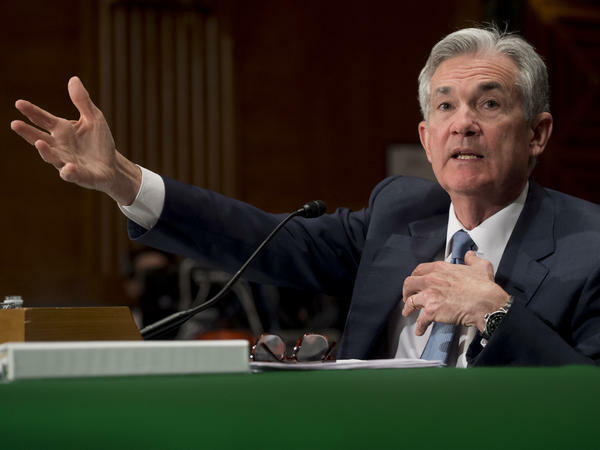 Federal Reserve Board Chairman Jerome Powell testifies during a Senate banking committee hearing in Washington, D.C., on March 1. This week, Powell presided over a Fed policy meeting for the first time since becoming chairman. In its statement, the Fed said the labor market "has continued to strengthen and that economic activity has been rising at a moderate rate. Job gains have been strong in recent months, and the unemployment rate has stayed low." In February, 313,000 jobs were added to the economy — the biggest increase in 1 1/2 years — and the unemployment rate held steady at 4.1 percent. Economists are wondering whether faster economic growth might cause the Fed to pick up the pace of its rate hikes. The Fed has signaled three rate increases for 2018, but accelerated growth could cause policymakers to add an additional hike. In its latest projections, the Fed Wednesday boosted its outlook for economic growth this year, lowered its forecast for unemployment slightly and kept its inflation projection unchanged. In a news conference after the Fed meeting, Powell said "the economic outlook has strengthened in recent months." He cited the stimulus offered by the big tax-cutting bill and said "ongoing job gains are boosting incomes and confidence" while global economic growth "is on a firm trajectory." The Fed "faces some key questions," says economist Mickey Levy of Berenberg Capital Markets. "How much momentum is there in the economy, and will the stronger growth be sustained, or is it temporary?" And Levy wonders, "will the stronger economic momentum generate overheating" and push inflation too high? The Fed has raised the benchmark federal funds rate six times in quarter-point steps since December 2015. Prior to that, the central bank held rates near zero for seven years to encourage borrowing and spending and help support the recovery from the Great Recession. Increases in the federal funds rate eventually move borrowing rates for consumers and businesses higher. Investors will be assessing how effective Powell is as a communicator. Levy says he expects Powell's remarks "to focus less than Yellen's on detailed labor market conditions ... and more on overall economic performance, and the Fed's role in supporting sustained expansion." Diane Swonk, chief economist at Grant Thornton, said she expects Powell to be "optimistic in his tone regarding the outlook for the overall economy." In fact, Powell told Congress recently that, in his personal view, the economy has strengthened since December, when Fed officials last updated their forecasts for the economy. At his news conference, Powell was asked about the economic effects of tariffs being imposed by the Trump administration. Powell said Fed policymakers don't think changes in trade policy will affect their current economic outlook. But he said trade policy "has become a concern" for business leaders a round the country. Powell will want to put his mark on the Fed, Swonk says, and one way he might do it is to increase transparency by announcing that he'll hold a news conference after every Fed meeting. Currently, news conferences come after only four of the Fed's eight meetings each year. On Wednesday, Powell said he will carefully consider the possibility of holding more news conferences but that he had not decided whether to do it. The Federal Reserve raised its key interest rate today. This came in Jerome Powell's first meeting as the Fed chair. The vote was unanimous for a quarter-point increase in the federal funds rate. That's the benchmark that many business and consumer rates are based on. As NPR's John Ydstie reports, the Fed also signaled interest rates could rise faster. JOHN YDSTIE, BYLINE: In his first news conference since taking the reins as Fed chief from Janet Yellen, Powell gave an upbeat assessment of the U.S. economy. JEROME POWELL: The economic outlook has strengthened in recent months. Fiscal policy has become more stimulative. Ongoing job gains are boosting incomes and confidence. Foreign growth is on a firm trajectory, and overall financial conditions remain accommodative. YDSTIE: And the members of the Fed's policymaking committee boosted their forecasts for growth in 2018, raising it to 2.7 percent - up from their December estimate. They also predicted slightly lower unemployment by the end of this year. But that forecast of stronger economic growth also includes an increase in the pace of interest rate hikes. While the Fed continues to signal a total of three rate hikes for this year, it added rate increases in 2019 and 2020. Powell said the committee continues to try to balance the risks of raising rates. If it raises rates too quickly now, he said, the Fed could stifle growth. But if it waits too long to boost rates, inflation could accelerate, and the Fed might be forced to raise rates even higher and faster. And that could push the economy into recession. POWELL: We're trying to take that middle ground, and the committee continues to believe that the middle ground consists of further gradual increases in the federal funds rate as long as the economy is broadly on this path. YDSTIE: For now, Powell said, he does not see any sign inflation is accelerating. When asked about slow wage growth, Powell said he's surprised wages haven't risen faster even though businesses report it's become harder to find workers. But Powell was less of a cheerleader for wage growth than his predecessor, Janet Yellen. POWELL: In terms of what's the right level, I don't think I have a view on what the right level of wages is, but I think we will - we will know that the labor market is getting tight when we do see a more meaningful upward move in wages. YDSTIE: Wells Fargo senior economist Mark Vitner had this assessment of Powell's first news conference as Fed chair. MARK VITNER: He looks very much in control at the Fed. I think that he's made a very strong case that interest rates are going to need to rise faster. He may need to beat that drum a little bit harder to get that message through. YDSTIE: Today's quarter-point rate hike was the sixth since the Fed began raising rates a little over two years ago. Before that, the benchmark rate was kept near zero to boost the economy after the Great Recession. John Ydstie, NPR News, Washington. Transcript provided by NPR, Copyright NPR.